Depending on the condition of your well, there could be microbes in well water that you don’t want. 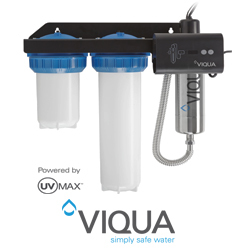 The Viqua UV water disinfection systems, provide safe drinking water without the use of chemicals. The in-line filtration system is designed to go at the end of your existing system (water softener/iron removal - In-Line Filter - UV Filtration).